This weekend was all about delicious food and beautiful weather. On Saturday, we had a wonderful dinner with friends. Because each of us had a personal connection to Mexico, our thoughtful hosts prepared a feast with many recipes from this special cookbook- Frida's Fiesta: Recipes and Reminiscences of Life with Frida Kahlo. Frida's stepdaughter, Guadelupe Rivera, compiled over 1oo recipes that she remembers Frida serving to her friends and family throughout her lifetime. Mixed in are anecdotes, photographs and paintings. I just purchased it for someone special, and it's shot up to the top of my own wish list (ahem, to those that are keeping an ear out for that kind of info). So, it was our job to bring dessert to the dinner party. As soon as I discovered the meal's theme, I knew what I had to prepare. 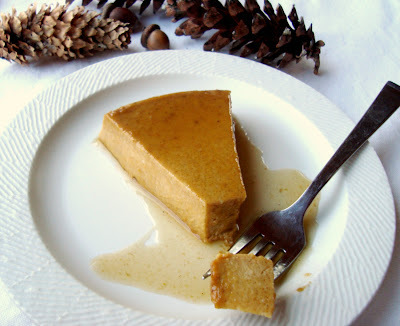 A couple of Thanksgivings ago, my sister-in-law made pumpkin chipotle flan. It was so insanely good, that it tends to haunt me come November. The flavors are sublime, with a complexity of smoky heat underlying the sweet and rich custard. The texture is smooth and creamy. And I'd love a slice right now as I'm typing! Here's the secret I'm not supposed to share... it's super easy to make. Just don't say that as you serve it in all of it's syrupy goodness. Let them think it took you days of preparation. Oh, and you know who gets credit for the recipe: Martha, of course! I eliminated the cayenne, but it was still a bit spicy for the younger set. They got brownies! i love the look and sound of this tart. Your handmade napkin holder is so beautiful. I think I would love to wear it in my hair. ahhhhh , sweetened condensed milk... now that's the secret ingredient right there!!! I love your photo styling in these shots! Beautiful.. The entire flan was organic... and sweet! Mmmmmmm! That looks WONDERFUL! It's looking like I'm over deserts this year and I'm thinking this one will go on the list. Oh yum! Sweet and spicy is my favorite combination. Throw pumpkin in the mix, and I'm done-fer. :) I'm going to have to try this. Oh my, that looks so yummy! Are the napkins holders for sale? the napkin holders are not for sale... but a tutorial for how to make your own is coming up in the morning. 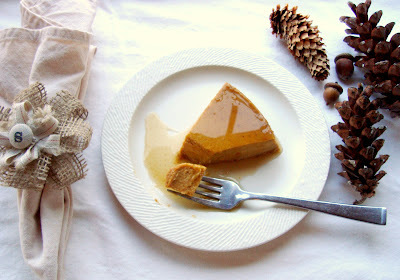 Just stopped by your blog and this dessert immediately caught my eye. Also, love your minimal style and it's all very chic.